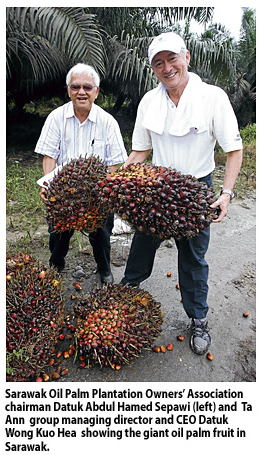 Suara Sarawak: Sarawak Oil Palm Owners Show True Colours – And Let Taib’s Cat Out Of The Bag! 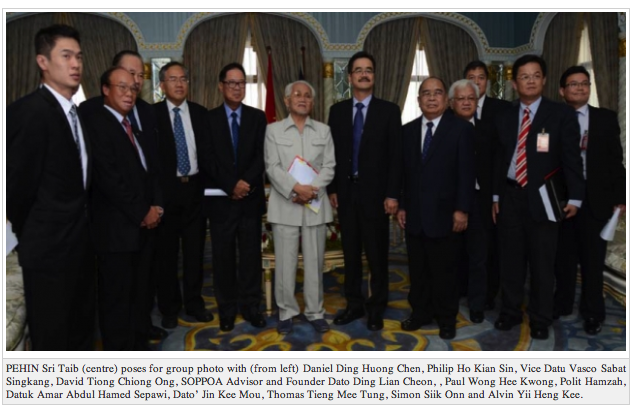 Sarawak Oil Palm Owners Show True Colours – And Let Taib’s Cat Out Of The Bag! The Sarawak oil palm industry has shown its true colours with its recent vitriolic attack on the Indonesian company Wilmar, which has announced that it intends to reform practices that have been destructive to the environment. It is clear from the press release that they issued at the end of last week that nothing matters to the Sarawak Oil Palm Plantation Owners Association (SOPPOA) except their own profits, despite various attempts at greenwash over the years. After all, like every money-making enterprise in Sarawak this outfit is tightly controlled by Abdul Taib Mahmud and it represents his attitudes. The SOPPOA Chairman is none other than Taib’s ubiquitous cousin, Hamed Sepawi, who also of course runs Sarawak Energy, Naim Cendara, Ta Ann, Sarawak Plantations and formerly the Timber Industry Development Corporation as well, plus numerous private concerns and plantations. But, in the process SOPPOA seems to have let a great big cat out of the bag, revealing that Taib is planning to tear down even more of Sarawak’s jungle than he has previously let on. A third more to be precise! 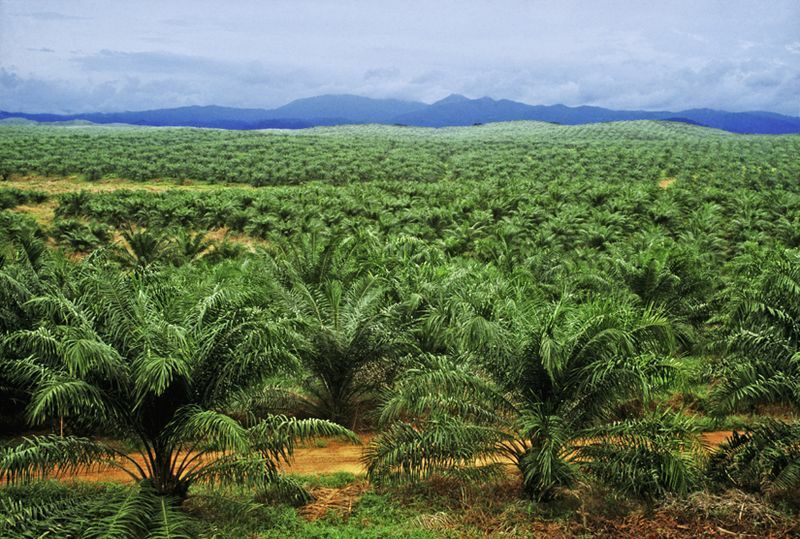 Taib plans to treble Sarawak’s oil palm plantations? Taib includes oil palm plantations in his definition of forest to get his figures that Sarawak remains ‘forested’. Sarawak has already covered a million hectares in oil palm, while the Chief Minister at the same time has laughably claimed that the country remains over 80% virgin forest. Taib and his side-kick, Land Development Minister James Masing, have further announced that they intend to double that huge area to 2 million hectares by 2015. The opportunity to fill politically well-connected pockets from yet more logging and plantation concessions are beguiling indeed. However this latest intemperate outburst against any move towards more responsible and environmentally friendly practices, for example avoiding ploughing up more peat jungle (the biggest single contributor to global warming) has apparently revealed Taib’s real plans. Attacking environmental responsibility on grounds of National Security! SOPPOA have told us that the actual plan is to plant 3 million hectares of oil palm and to ignore all the basic international guidelines in the process. Sarawak remains the only state in the world that has not banned the further destruction of peat jungle. Such is the destructive and greedy arrogance of Abdul Taib Mahmud, who considers himself above all laws and restraints, particularly when it comes to making money. This is the man who dares posture as a leader with environmental credentials and to promote “eco-tourism” in his family owned hotels on land snatched from the native people. His unbelievably greedy and destructive practices have become a stunning embarrassment to the country of Malaysia, which is now attempting to sign free trade agreements with the European Union that exclude Sarawak. This is purely because Taib refuses to adopt basic responsible practices towards state lands and the Borneo Rainforest. His hangers on and lackeys in SOPPOA of course are singing his tune and earning their irresponsible livings in a way that damages the planet for each and every person living on it, but most particularly harms the poor native people of Sarawak, who have lost their jungles to an industry that benefits only the wealthy political families in charge. So SOPPOA have taken their place amongst the climate change deniers and those scientifically ignorant businessmen, who always know better than the scientists when it comes to anything that affects their profits. Without doubt the Malaysian ‘scientific study’ funded by the likes of SOPPOA will conclude there is no problem with felling and burning of peat jungle and they will demand we all believe them. 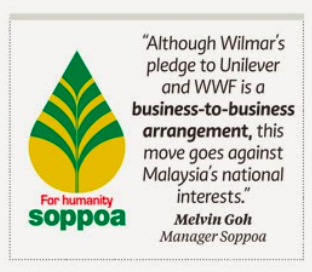 SOPPOA gained membership of the Round Table On Sustainable Palm Oil back in 2008, apparently. Isn’t it time they were chucked out? I know what’s best for me. Taib and his obedient circle of plantation owners.